Originally published in APPPA Grit Issue 19 (Spring 2002) by Kip Glass. A major debate in the pastured poultry industry is whether the moveable pen or the day ranging system is better. I decided to do a study to compare the two systems to help fuel debate. Labor input - is there any time and work savings between the two production systems? 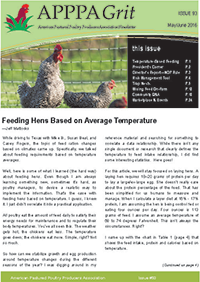 Feed conversion - is one system better than the other in the total weight gain of the bird? Pasture Considerations - does the pasture respond differently between the two models? Bird Health - how does the condition of the birds compare, mortality rates, etc.? Let me begin with a description of what the two production models are. Moveable pen is where the birds are enclosed in a floorless structure and not allowed to range from it to forage. The only forage is what is available underneath them in the pen. Food and water is placed in the pen where it is constantly available to them. The pen is moved once or twice daily to allow the birds more forage and for better manure dispersal. Day range pen is where a semi-permanent shelter with bedding houses the birds, but the birds are let out to range. An electrified netting, rotated on a regular basis, contains the birds in different paddocks around this shelter. The netting protects against ground predators. Water and food is supplied to the birds in the paddocks and in the shelter. Shelters - shelter size was 12' x 16' with 160 birds stocked into each pen during each production cycle. This allowed an average of 1.2 sq. ft per bird. The moveable pen was moved once a day until the birds reached 5 weeks of age and then twice a day until the seventh week. Half the birds (80) were harvested at 7 weeks in each shelter. The moveable pen was then moved only once a day because of low pasture impact. The Day Range pen had a door on each end, and the electrified netting was rotated around four different quadrants of the five week cycle of birds. The first quadrant had birds on it for 14 days, second quadrant-10 days, third-8 days, fourth-7 days. The netting was 165 foot long making each quadrant approximately 40' x 40'. Again, half the birds were harvested at 7 weeks of age, the other half at 8 weeks. After the harvest of the last birds the day range shelter is skidded forward to next fresh spot in the pasture to start the next batch. Pasture coverage by the moveable pen, moved on the above schedule, covered 9024 sq. ft. during the 5 weeks, the Day range pen covers 7300 sq. ft per 5 week schedule. Feed - each pen was fed the same pounds of feed each day. The feed mix used was the Fertrell broiler grower formula. Feeders in the day range areas were moved to different locations in the paddocks daily. Water - Moveable pen was supplied with 2 five gallon buckets with attached Plasson bell type waterers. The Day Range pen had a trough float valve waterer in the pasture attached to a 250 gallon water tank with supply line. Because of daytime heat, I incorporated a bell waterer in the shelter attached to a 55 gallon supply barrel. Weather & Field Conditions - two comparisons were run from early spring to early summer, and two were run from late summer to early fall. This was to balance the study over varying pasture and temperature conditions. The pasture was mainly fescue, with thinning brome, numerous broadleaf weeds, and in summer, late fall very thick lezpedeza. As you can see from the chart there is really not significant labor time savings between the moveable pen and day range pen. Actually if the moveable pens are designed thoughtfully and light enough where they are easy to move, then there is no real strenuous labor involved with the moveable pen. With the day range pen, daily chores are easier. All you have to do is let the birds out, feed them, and put them up at night. Moving the electrified netting is very simple and is only done four times during each batch. Skidding the heavy shelter is not as time consuming, but it takes mechanical or animal means to do it. The more labor intensive part is the hauling in and out of the bedding. If you don't save it, you have to spread it on the pasture either by hand or mechanically. And if you save it to use for compost, you have to haul it away. Of course, there is a great value in the compost, especially if you have a market garden or other use for it. With the moveable pen there is a quicker turn around time of restocking the birds after the last harvest. Just move the shelter forward one spot, throw in feed and water and add the birds. In comparing the labor, I think the main perception is that there are a lot of days in the day range where we don't really do a lot, and it makes the days in which we have to do the hard work not seem so bad. More on the labor issue in the closing statements. With the day range, watering is a lot easier using a large supply tank and automatic waterers. You only have to fill the main supply tank a few times each batch. With the moveable pen this could be done but would be a little more difficult as the pens are moving all the time and the supply lines would be snagging on the grass etc. But it would be doable. We elected in this study to use buckets that have to be filled every day as most people that use moveable pens do it this manner. One major issue with water in the day range group is you have to have water in the shelter during the hot days, as the birds will not even venture 3 feet out of the shelter into the sun to drink. They would rather perish in the shade then go outside to drink. As far as feed, the birds in the moveable pen consume their feed a lot quicker and I'm sure they would have eaten a lot more, in a shorter time span, if they have the feed in front of them at all times. With the day range pen if it is hot and sunny out, they will not go out very often to eat and would eat only in the mornings and then wait to the end of the day to eat as it got cooler. I'm sure this limited their total consumption, but this could be remedied by putting feeders inside. As far as the birds condition, the moveable pen birds were a little more soiled as part of the day they are in their own manure. The day range birds were noticeably cleaner. If it rained, the moveable pen could get pretty wet if water ran under the pens and soaked the birds. This can be a major problem during extended rainy spells. Aesthetically the birds roaming in the grass just looked happier and anyone else that saw the two models made that comment too. Even though the moveable pen covered more total area during each batch, effect on the pasture was significantly more noticeable. Even though in the day range pen we moved the feeders around everyday, manure dispersal was very sporadic. Since the birds spend most of the hot day and all night in the shelter, I would estimate that more than 50% of the total manure produced goes into the bedding. With the moveable pen the pasture is more evenly coated with manure. One negative factor of the day range shelter sitting 5 weeks in one spot, there is an area of pasture killed where it sat. A majority of my mortality problems, I feel, are because of my brooding facility. My conditions are too cramped, and the light level is lower than I would like. This I think has led to more than normal leg problems which I will correct next year. There really weren't any noticeable problems except for batch one. The moveable pen birds got pretty wet one chilly night and that led to later ascites problems. Hawks were a small problem for batch three, but not that bad. I know a lot of other pastured poultry producers have significant hawk problems. This is an area that needs to be addressed for many. The addition of a floor in the day range pen added a large amount to the cost of the day range pens. Also, the use of netting added over $150 to the day range cost per pen. These two factors, of course, can be amortized over several batches for several years. My bedding source was free, but in most areas that is another expense. For the most part the day range pen lagged behind the moveable pen in weights. Batch two I can't explain why they were so close in weight. Batch three, I harvested 2/3 of the birds in the moveable pen at the seventh week because they were cockerels and would have been too big by the eighth week. This skewed the results for that batch and would have made a larger total weight for the moveable pen. I think batch four moveable pen weights were lighter because of cooler temperatures. These birds had to lie on the cool ground using up more of their feed to produce heat energy thus the lighter weights. I think that the larger weight difference between the moveable pen and the day range pen can be attributed to the feed being right in front of the birds at all times in the moveable pens. The birds in moveable pens could have consumed a lot more feed and probably reached their market weight a lot quicker if I would have given them more feed than the day range. That would be another good study to do. As with any extensive study, I guess these results bring up more questions. I think the Pastured Poultry industry needs to do more comparisons, look at more possible models. There are really good factors of each production model that I wish could be incorporated into another study. Every individual needs to assess the good and bad points of each system, and see how well it will fit into their situation of production. Maybe for those who raise under 1000 birds a year the moveable pen is more feasible, but above 1000 the day range system might be better. Do some number crunching and see if that 1/3 of a pound lighter weight will affect you very much with all your fixed costs. 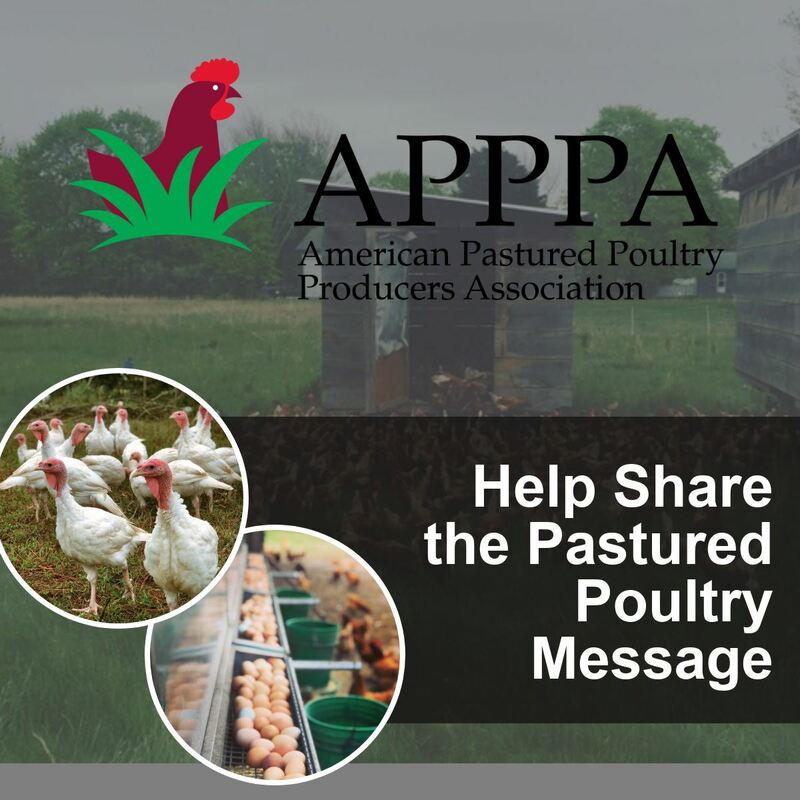 Let's all do some creative thinking and research and strive to improve the Pastured Poultry industry.